Since 1972, Sign of the Crab has specialized in providing high-quality, SOLID BRASS, products for the home. Each fixture we produce is a reflection of our relentless pursuit of quality and improvement. All of our faucets are tested and hand assembled before shipping from our facility in California. For over 45 years, our customers have placed their trust in us. We have traveled tirelessly to find new items, to keep our quality high and to keep our pledge to you: We will continue to search the world for the highest quality products and the best people to serve you. Each item is individually assembled and tested in the United States. Our faucets are constructed with high quality, low lead brass. Our lavatory & kitchen faucets are lead free per California AB1953. They meet all current regulations with regard to lead composition. Most of our cast iron tubs are IAPMO approved. Our tub legs are constructed of solid brass with chrome or nickel plating or our electrostatically applied Supercoat, Satin Black or Oil Rubbed Bronze finishes added. Our white tub legs are constructed of cast iron with premium gloss paint added. All of our tubs include adhesive non-slip strips for the consumer to install. All faucets will be shipped with 1/4 turn ceramic valves. Our 1/4 turn ceramic cartridge uses 2 ceramic disks that rotate to open and close the valve, minimizing mechanical wear. Thermostatic valves control the constant output temperature of the faucet. 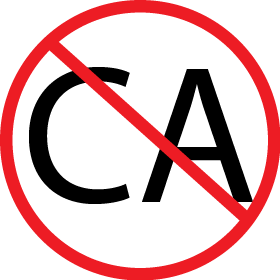 The products displaying this symbol in our catalog are not for sale in California. 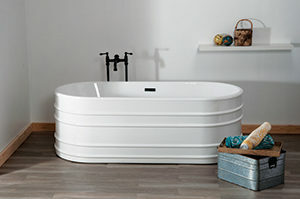 Our tubs are warranted to be free of manufacturing and finish defects for a period of 5 years from date of purchase, when properly installed by a qualified, licensed plumber. In most cases on-site repair of the tub will be accomplished, minimizing the inconvenience to the customer. Most of our Cast Iron tubs are IAPMO approved. All items are warranted to be free of manufacturing and finish defects for a period of 5 years from date of purchase, when properly installed by a qualified, licensed plumber. For items other than sinks & tubs, this warranty covers replacement of defective parts, not of complete product, unless deemed necessary by a customer service representative. The warranty does not extend to labor charges or air freight charges when repair or replacement of the item is needed. The warranty only applies to interior installations. Our products are not warranted for outdoor use. Effective as of 2015, we now offer a Limited Lifetime Warranty on our cartridges for all of our faucets, for as long as the original purchaser owns the unit. We will provide new cartridges as deemed necessary by our Customer Service Department to the original owner only with provided proof of purchase. All our ceramic faucet handles are warranted for 5 years from date of purchase. Any ceramic faucet handle developing cracks or chips will be promptly replaced, as a cracked or broken handle may result in personal injury. Our finishes include Chrome, Matte Nickel, Polished Nickel, Supercoated Brass, Oil Rubbed Bronze finish, Satin Black, Unlacquered Brass, Unlacquered Satin Brass & Unlacquered Raw Brass. The Nickel Finishes and the Unlacquered Brass finishes are living finishes and will patina with time. Chrome & Nickel finishes are warranted against defect for a period of 5 years. The Oil Rubbed Bronze and Satin Black finishes are “non-living” fragile finishes that must be inspected prior to installation and is not warranted further. The Unlacquered Brass finishes carry no finish warranty. See our Supercoat Brass finish warranty and proper cleaning instructions below. Our Supercoating is a 2 part epoxy, applied electrostatically, and baked on our brass products to insure a lasting shine. It is absolutely guaranteed for as long as the original purchaser owns their home and proper maintenance instructions are followed. The product must be returned to our factory for re-coating. We will re-coat, not replace the product if a defect of the Supercoat finish occurs. Care of Supercoat Brass – Supercoat brass items should be wiped gently with a soft cloth after each use. Plumber’s putty should not be used for installation. Use of plumber’s putty, detergents or abrasive cleaners will void the warranty of the finish as they may cause deterioration of the coating. We recommend a bead of waterproof silicone where putty is needed. Installation instructions are included with every faucet and are also available on our website at www.signofthecrab.com. Prices and products are subject to change without notice. Unless price is protected in writing, shipment will be at prevailing prices. We only sell wholesale to qualifying trade accounts.